Jon Stewart, in his typically self-aware and self-deprecating fashion, prefaced this episode of “The Daily Show” with a warning that it would become a shameless plug for his new film, “Rosewater,” which opens in theaters today. And so it did, pulling out all the stops. A touch of nostalgia was delivered in the form of John Oliver, returning to host. Oliver, as we all know, took over the program while Stewart was away directing his first feature film based on the true story of journalist Maziar Bahari (portrayed by Gael García Bernal) who was detained and interrogated for 118 months by Iranian forces. 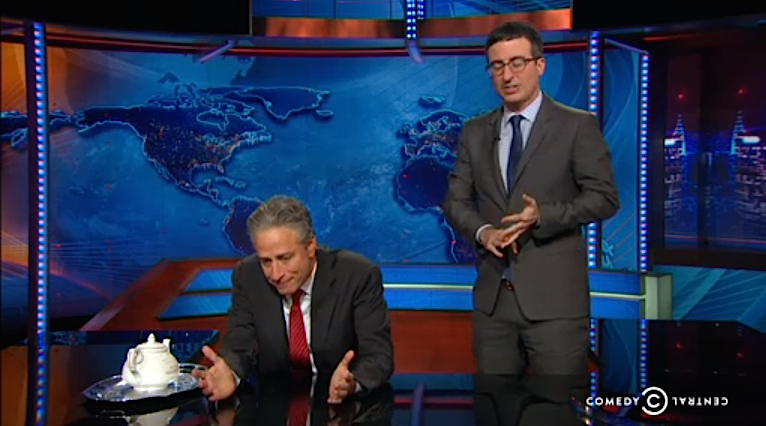 Appearances in the episode included Bahari himself, who said, “Let me start with Mr. John Oliver: You’re welcome,” pointing out that if it wasn’t for Bahari’s arrest, Stewart would never have made “Rosewater” and Oliver would never have hosted “The Daily Show,” a move that skyrocketed his career.